Prior to the event, tickets can be picked up at Historical Society office, 511 Broad Street during normal office hours, Mon-Fri, 10am-4pm. On tour days, April 12-13, tickets can be picked up at the will call tent outside the Historical Society office at 511 Broad Street from 9:30am-4pm. This is a rain or shine event. Tickets are nonrefundable. General Admission ticket is listed at $25 but is “on sale” until midnight tonight. New Bern’s history is a remarkable story of strength and resilience. We won’t let Hurricane Florence rewrite that history! Join us as we celebrate the endurance of New Bern’s beauty and charm with a very special Heritage Homes Tour on April 12-13. This self-guided tour includes 18 exclusive properties, some never before open to the public, in five historic neighborhoods: Downtown, Dryborough, Riverside, Ghent, and DeGraffenried Park. 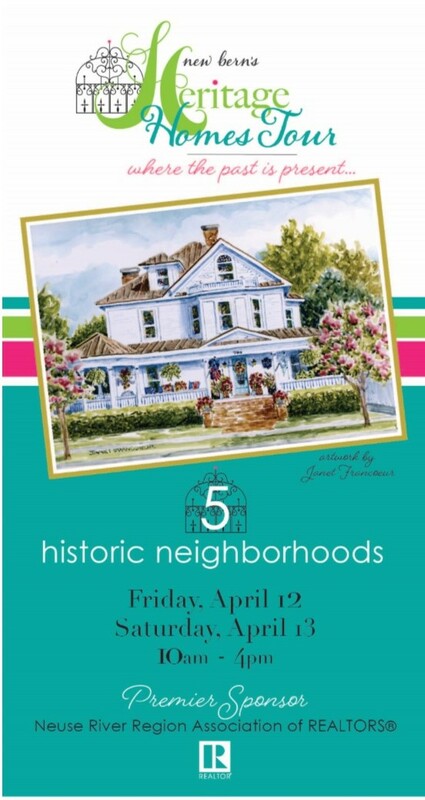 Tour includes homes undergoing renovation, gardens, a very special Garden Party with live music on the Back Porch Stage, costumed historical characters, heritage gardening demonstrations, and more. For complete details and a downloadable brochure, click here. Tickets on sale now on our website and at New Bern Historical Society, 511 Broad Street. On sale in outlets by March 15. Ticket prices $20 advance, $25 days of event, $15 active duty military, students, and Historical Society members, $15 ea for groups of 10 or more.